U.S. 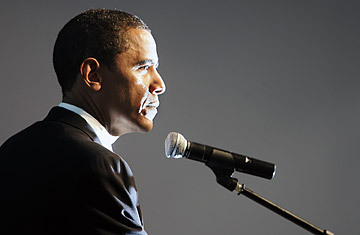 Senator Barack Obama speaks to the congregation at St. Mark Cathedral Family Church on January 15, 2007 in Harvey, Illinois. Illinois Senator Barack Obama made official today what has been evident for more than two months: he's deciding whether to run for President. But in reality, his announcement that he's forming an exploratory committee means that the exploring is over. For the last several months, Obama, 45, has been making phone calls to prominent Democrats, meeting with labor activists, fundraisers and members of Congress and figuring out how to organize a presidential campaign staff. Last month he went to New Hampshire, where he was given a reception that veteran political observers there said was practically unprecedented, with tickets for a party fundraiser sold out days in advance. Now, having lined up several top-level Democrats to work for him, he is slated to announce his candidacy officially on Feb. 10 in Springfield, Ill., the hometown of Abraham Lincoln. He'll join a field that already includes Iowa Governor Tom Vilsack, Senators Chris Dodd of Connecticut and Joe Biden of Delaware, former Vice Presidential nominee John Edwards, and Cleveland Congressman Dennis Kucinich. And then, of course, there is Hillary Clinton, who has already hired a number of key staffers and may also become an official candidate by the end of this month. Obama starts out with a level of grassroots enthusiasm that few contenders in recent history have enjoyed. An Internet-based Draft Obama movement has picked up 15,000 signatures, and run ads in New Hampshire and Iowa promoting his candidacy and begging him to run. Donna Brazile, a Democratic strategist who is not officially working for Obama, has been getting resumes from people eager to work for the Senator's presidential campaign. Party operatives without any affiliation to Obama say they're getting cold calls from fundraisers, offering to raise $100,000 on his behalf. His book The Audacity of Hope has been a best-seller for months. And he will begin his campaign with some major advantages over Clinton. It will be hard, for one thing, for Clinton to dominate Obama in fundraising the way she might the other candidates. Some Democratic moneymen have already dumped other candidates to raise money for Obama. He's beloved by the Netroots activists, who can help him raise money easily over the Internet. Many liberal activists in the party, who will provide much of the energy and money for any Democratic candidate, are strongly opposed to the war, a position Obama adopted before the the conflict started  unlike Clinton, who has in the last few weeks started to distance herself from the decision to invade Iraq, saying she would not have cast the same vote she did in 2002. The fact that a man who has served only two years in the U.S. Senate is being embraced by so many Democrats is a sign of the party's doubts about their other contenders. In particular his candidacy has helped highlight a question that dogs Clinton constantly: even if she wins the nomination, can she win a general election? In fact, it's Obama, not Clinton, who seems to have struck the most fear in potential Presidential rivals: Edwards' staff has watched the Obama boomlet rise with particular trepidation, and it's a safe bet that the enthusiasm Obama drew in New Hampshire helped seal Indiana Senator Evan Bayh's decision not to run. Of course, Obama also starts out with expectations that may come back to haunt him. Because of his inclusive rhetoric, he's been embraced by liberals, moderates and even some Republicans and evangelical Christians. But no matter how many videos his campaign staff puts out showing his 2004 convention speech in which he talked about getting beyond those divides, a presidential campaign will force him to stake out clearer positions that will inevitably alienate some. Moderates and conservatives will learn that Obama has a more liberal voting record than Clinton, according to congressional voting rankings, while liberals will find that he's not in favor of pulling troops out of Iraq as fast as many would like. And an Obama win would have to be the ultimate triumph of hope over experience. One close adviser said the long lines at his book signings helped convince him to consider running for President this year, rather than waiting. "I certainly didn't expect to find myself in this position a year ago," Obama said in a speech on his Web site that accompanied his announcement. "But as I've spoken to many of you in my travels across the states these past months; as I've read your emails and read your letters; I've been struck by how hungry we all are for a different kind of politics." As a Senator for just two years, Obama has a thin record. And those who have counseled him about running have wondered if he can handle the attacks that will inevitably come in a difficult race, especially since he's never run a campaign of anything close to this intensity. "Barack is an inspiring candidate, but inspiration is not enough," says Marilyn Katz, an anti-war activist in Chicago and longtime Obama ally. "They have to transform that inspiration into organization." And there is one final issue that hovers over the Obama candidacy: race. Only a handful of African-Americans have even won statewide office in the last decade. That's why Robert Ford, a black state senator from South Carolina who is an Obama fan, says he'll back Edwards or Hillary Clinton. "Obama would need 43% in some states of the white vote to win, and that's humanly impossible," Ford says. "We in the South don't believe America is ready to elect a black President." That's not a view all civil rights activists have; Jesse Jackson, for example, all but endorsed Obama in a speech yesterday. For the moment at least, Obama enters the primary contest in a position any contender would envy  even Hillary Clinton.